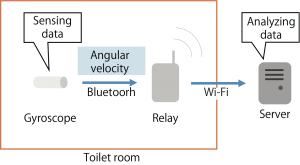 Biological information can easily be monitored by installing sensors in a lavatory bowl. Lavatories are usually shared by several people, so users need to be identified. Because of the need for privacy, using cameras, microphones, or scales is not appropriate. Though personal identification can be done using a touch panel, the user may forget to use it because the action is not necessary. 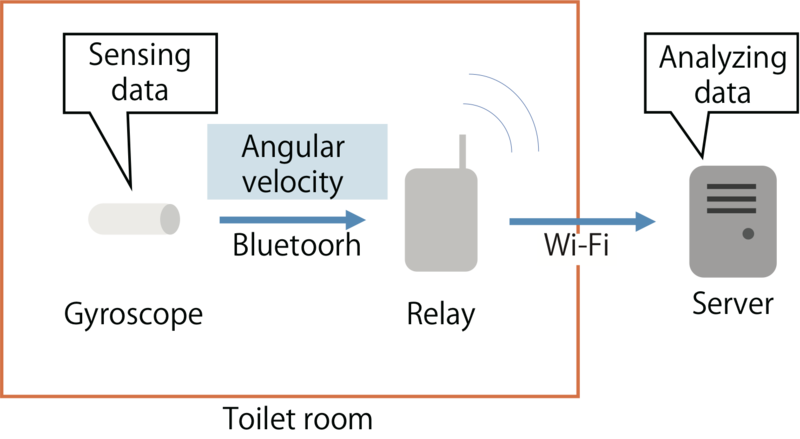 In this research, we focus on the differences in the way of pulling a toilet paper roll and propose a system that identifies individuals based on features of rotating of toilet paper rolls with a gyroscope. Personal traits are more likely to appear in the way of pulling a toilet paper roll because most of us have never watched someone pulling a roll or never learned how to pull one. Therefore, we propose a system that recognizes individuals based on how they pull a toilet paper roll. The method uses one-axis angular velocity heading to the rotation of the paper roll. User privacy is protected because only angular velocity is obtained. The system identifies the user based on how the toilet paper roll is pulled, which is a natural movement, and the user does not have to be aware of the system. In addition, the user does not have to carry any devices because the system is completely installed in the environment.